#TVisCOOL: Fat driver struggling to get out of his low-slung BMW!!! Fat driver struggling to get out of his low-slung BMW!!! 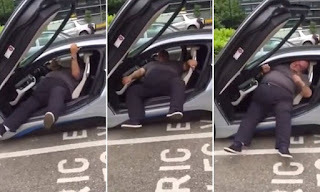 This bizarre footage shows an obese man struggling to get out of his new car. The stout fellow huffs and puffs for the best part of a minute before finally emerging from the low-slung, gull wing-doored vehicle. He is filmed by his pals trying to escape ill-judged choice of BMW. They can be heard laughing hysterically in the background while shouting advice at the tubby motorist. "Bizarre footage shows obese driver struggling to get out of his low-slung BMW"